Today, during our morning Bible lesson, Jon's assignment was to write down 5 gifts that we receive when we become children of God. He got the first couple pretty quickly and without my prompting: Heaven and Forgiveness. 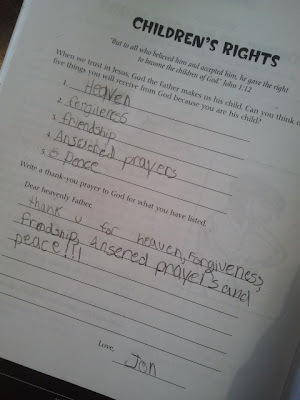 He needed a little nudging to come up with the last three: Friendship with God, Answered Prayers, and Peace. I explained to him that we have Peace because we know God is ALWAYS with us and that we are never alone. As he was writing down number five, Peace, he blurts out, "So he was with all the kidnapped kids, and murdered kids, and all the raped kids?" I answer without thinking, "Yes!" Uh oh, I immediately realize that I'm going to have to now explain my answer. My mind races for the best way to word my response. This is a big moment. How I answer this question could shape his faith for a long time. I do my best, trusting God to guide my words, "We serve a good God, Jon, but, there IS evil in the world. And sometimes God allows evil things to happen, but we can trust that even in the hard times and the painful times, that God has a GOOD plan for our lives..."
He interrupts me, "Like Jesus." I'm confused, "What do you mean, son?" "Look at all the painful stuff that happened to Jesus. It was all part of God's good plan." I feel a tear coming up, but I hold it back. "Yes, like that." We didn't discuss it anymore. He got it. He gets it. It's taken me 25 years to even BEGIN grasping this concept, the concept that God is present even in our pain, and that the pain may even be a part of his GOOD plan for us, but here is my 9-year-old son, getting it. #19. a 9-year-old asking the tough questions. #20. a 9- year old answering the tough questions.